You might not have heard from us in a while, but it’s been a busy couple of years. We are definitely not complaining. We have worked with some great clients on some amazing projects both residential and commercial and we now have the possibility to showcase in the BCO Awards this year. One of the BCO’s primary objectives is to define excellence in office space. As part of this objective their annual Awards Programme provides public recognition for top quality design and functionality and a benchmark for excellence in workplaces. Having been a supporter of the BCO, this year we have decided to enter this coveted and highly sought after accolade. We have been working hard on a number of amazing commercial projects and there would be certainly more than one worthy of an entry. However, we decided to enter the creative fit out of Ceridian offices based at Skypark in Glasgow. Ceridian is a leading software vendor within the Human Capital Management space. Their technology, Dayforce, is designed to help their customers achieve high employee engagement and improve productivity throughout the employee lifecycle. 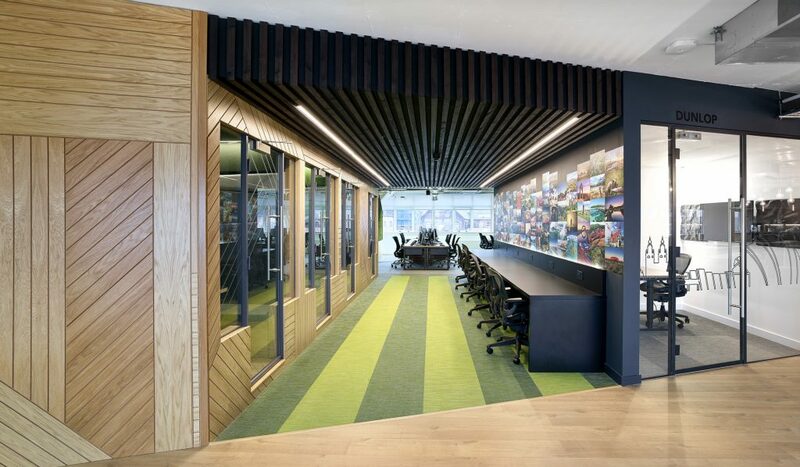 We were inspired by the brand promise, “Make Work Life Better”, to create the design of Ceridian’s UK headquarters aimed to reflect the values of the company; customer focus, transparency, diligence, optimism, and agility and to create a space where employees truly wanted to come and work. Ceridian had outgrown their current office space. 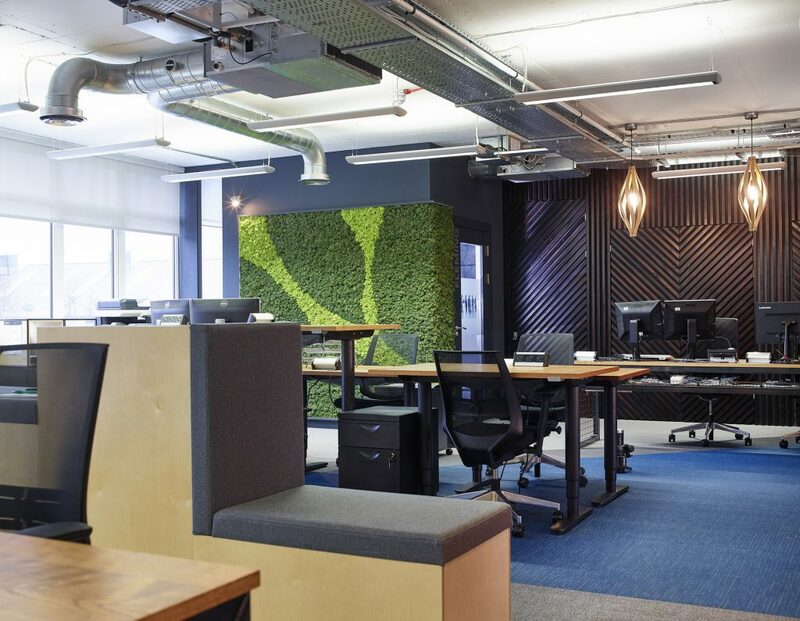 A refurbished fit for purpose space which truly reflected their brand values was required which suitably accommodated their European headquarters. Accommodation was required for the current team but required space for growth with a projected 30% increase to headcount over 3 years. The office space had to be flexible with the ability to adapt and change with them as they grow. 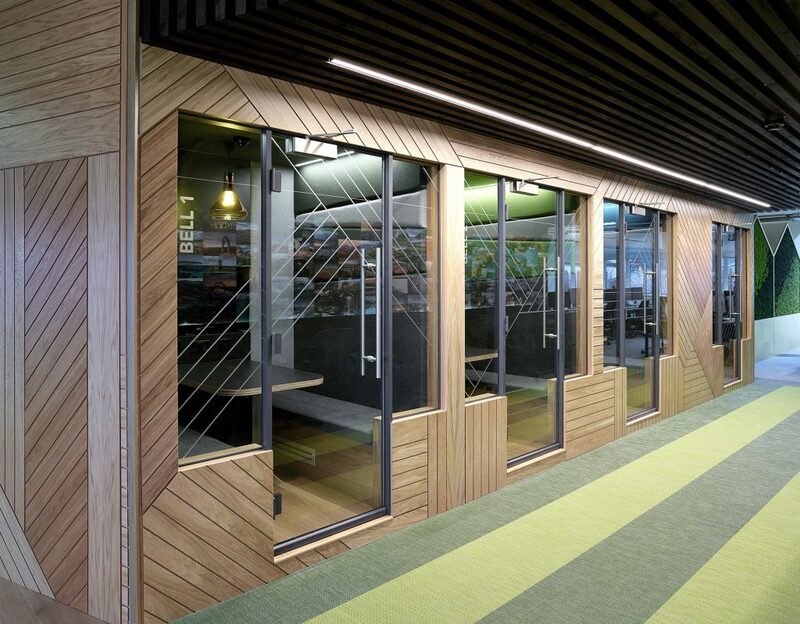 The focal point of this fit out was to use a wedge-shaped design to create the division of space required to allow multifunctional spaces both either side and within. A transparency was created using the original glass and additional glass in the internal form of the wedge shape. Space was a challenge for this build. However, we were diligent in our approach to creating an optimistic work environment, where employees can move flexibly throughout the working day. 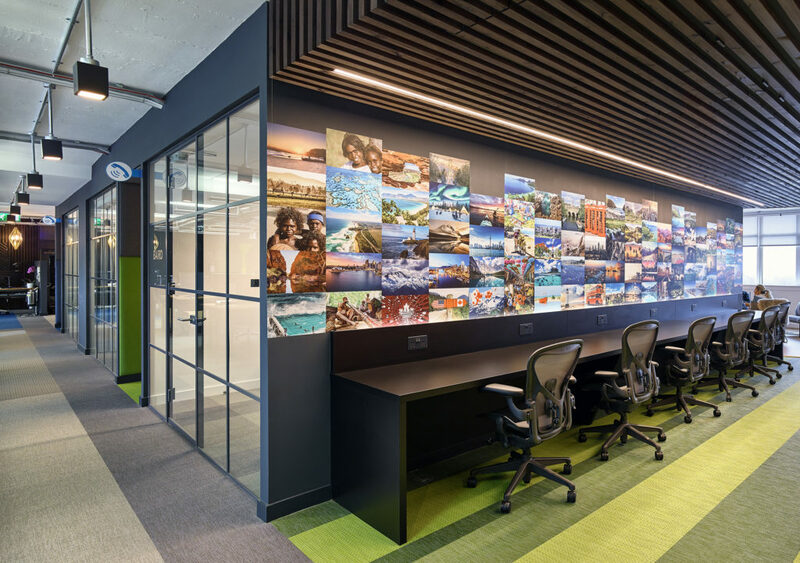 The use of materials, textures, divisions and partitions, fabrics and furniture create a fit for purpose workspace which is inviting and engaging. Together with the Dayforce Team we met with the BCO Scottish Region judges to walk round the design elements of this fitout and to showcase our innovative additions to this project. We now wait in anticipation as to whether we will be a chosen finalist. If you have any questions about how Julia Grant Interiors can collaborate with you to create an amazing office space that your employees can be proud of then please get in touch with Julia@juliagrantinteriors.co.uk directly.